Another summer comes to an end as another school year starts. Another year where nothing has really changed inside my home. Another year where not one project has been completed anywhere. Instead walls, pictures, tables, chairs, sofas, floors, rugs, shelves, door trim, and baseboards wait patiently to be redone, repainted, recycled, reupholstered, refinished, hung, cleaned, dusted, and/or polished in every room of the house. My family and I have lived in our home since April 2008. The house was built in the late 1970s and had some updating in the early 2000’s. The previous owners had the popcorn ceilings removed downstairs, the kitchen cabinets and appliances replaced, a tile floor laid in the kitchen, and fresh paint throughout the house. For us, it was move in ready. We saw things we wanted to change to reflect our taste but nothing was pressing enough to get done before we moved in. Fast forward to the present day (7 years later) and not much has changed except for the amount of stuff in our home. (See the About Me page for the kind of stuff I mean.) 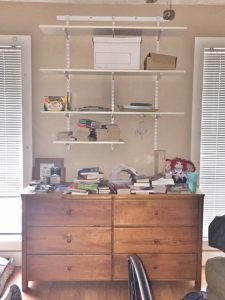 My husband and I have started many projects but haven’t completed any of them. The rooms in our home are all functional but lack a sense of completion, continuity, and aesthetic appeal. I have spent too much time envisioning and not enough time doing. There are many excuses for the stagnate state of our home and I am ready to face them head-on as I begin the process of making our visions a reality. 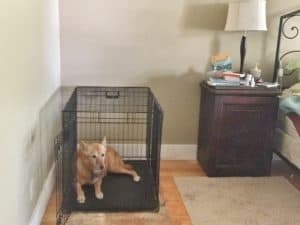 Resting comfortably in her crate is Caramel, our 14 year old Australian Shepherd/Lab mix. She was our son’s dog until he went off to college. Now, she is very attached to me. Her favorite place to hang out is our bedroom, so her crate is there. A piece of linoleum under it keeps it from sliding along the floor. She has some arthritis in her back legs and has started having a little trouble getting traction on the laminate flooring when she stands up. We bought an inexpensive carpet to lay by my side of the bed because that is her favorite place to sleep. In addition to her crate and the area rug, Caramel’s contribution to the master bedroom is all of the fur that she sheds… it is everywhere! My nightstand is next to her crate and is an old Singer sewing machine cabinet with a working machine still inside. We picked it up at Goodwill for $25! In my mind it was a great deal because I could repurpose a a part of history. My plan was to learn how to refinish then stain it a lovely oak color. That was several years ago and it is still the worn stain that it was when I bought it. Now, though, it is covered with books, Caramel’s treats, dust, and dog hair. This is our bed and the light from the window makes the floor look really clean! (In reality, there are dog-hair dust bunnies and dried dog drool all over the place. In fact, we picked that color of laminate because it was the color of Caramel’s fur. (Cleaning is not high on our list of priorities.) I don’t know if it is her age, the summer heat, or the fact we don’t Swiffer the floors frequently, but she seems to be shedding a lot! 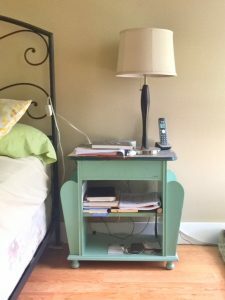 This is the nightstand on Douglas’s side of the bed. I love the shape, however, the top is missing part of the veneer cover, and the paint is warped and peeling in some places. I found it at a large flea market over 10 years ago with the intent to fix and repaint it. To the right of the nightstand, you can see the corner of a pillow for Caramel to lay on. She likes to lay on it in the morning and look out the window. As a result, his nightstand is covered in hair, too. The chair is one I picked up at an estate sale. It has good bones, no odor, is comfortable to lounge in with a book, but has torn fabric on the back from where a cat scratched it up. It just needs to be reupholstered. (Something I told myself I would do when I bought it.) This chair sits in front of the window to the right of the dresser in the previous picture. Behind the chair is a beautiful framed print that I bought over 3 years ago. It still has the protective corners on it from the store. The trunk next to the chair is an old Army trunk from a neighbor that lived next door to me in Michigan when I was 18. His name was Alvin and we had many good conversations at his kitchen table. When he passed away, I lived in Texas. My dad called to tell me he had died and that Alvin wanted me to have his Army trunk. It has served many purposes over the years. Now it is being used as an end table. It is not the most attractive piece, but seeing it brings back good memories. The blue armoire used to belong to one of my good friends. 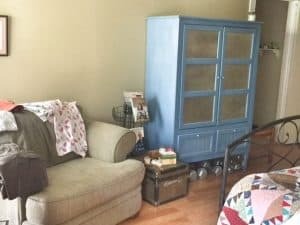 She redecorated her home and didn’t want it anymore. It was made to be an entertainment cabinet, but we use it to hold all the quilts and afghans my mom has made and given to us. I love when I can repurpose something! 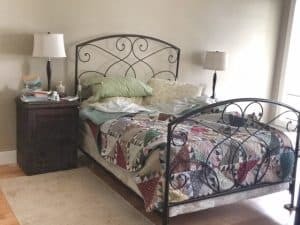 That’s the master bedroom – BEFORE… now I need to plan for the AFTER! I love this! The descriptions are perfect and I can’t wait to see what you iccomplish. Audrey, however, cannot stop laughing. Thanks, Michelle! I’m really excited to get started and bring about changes to all the rooms in my home. As my sister and living next door to me, you know more than anyone how I pour my heart and soul into my work during the school year and then take weeks to decompress during the summer. As a result, I’ve been unable to make the ideas I have for my home into a reality. Tell Audrey to stop laughing…this is the year her aunt will iccomplish many things at home!